Month of May was full of religious, spiritual and philanthropic activities at the Sivananda Ashram, Ahmedabad. At dawn of May 2, 2004 worship service of Sri Yantra was performed at Sri Ashtlaxmi Bhavan by Pujya Swami Adhyatmanandaji Maharaj. Nine couple joined Pujya Swamiji for Sri Yantra Pooja.. Entire atmosphere was surcharged with divinity. In the forenoon, a holy Navachandi Yajna commenced with Sri Ganesh & Mahalaxmi pooja. Yajna continued up to late evening with mantra chanting by the priests which concluded with Arati. Large numbers of devotees participated in this solemn occasion. Devotees from all over India and abroad including USA, UK and Muscat gathered to celebrate Shashtipurti Mahotsav (60th Birthday celebration) of their beloved Swamiji Maharaj. Three day celebration commenced in festive mood with Garba function on evening of May 1, 2004 at campus ground of Sivananda Ashram. 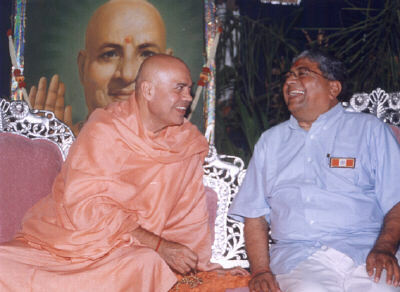 On eve of May 2, 2004 after Sri Navchandi Yajana, public meeting to felicitate Pujya Swamiji was organized in august presence of Rev. Sri Jashbhai Patel of well-known ANUPAM Mission, Mogri. Respected Sri Surendrabhai Patel, president of Ahmedabad Urban development association was the chief guest of this function. Both of them gave very heart touching speech in praise of Pujya Swamijifor His Services to the Mankind. ‘SURMANI’ Smt. Monikaben shah, an accomplished singer, provided opening prayer in her melodious voice and young artist of “Nrutya Bharati” dance school gave enchanting Bharat Natyam Dance performance. At the end food was served to all devotees. The Morning of May 3, 2004 (actual birthday of Pujya Swamiji) “Ayushya Homam” (Yajna for good health and long life) was performed for Beloved Swamiji Maharaj. In the evening public gathering was held & Vice Chancellor of Gujarat University Dr. A. U. Patel presided over the function and shared words of wisdom. As Rev Sri Swamiji has not been accepting flower garlands, devotees presented him a number of saplings for the plantation in the Ashram premises. Also Rev. Swamiji wished the plantation of 60,000 trees during his diamond jubilee year. Efforts will be made to fulfill his wish by the devotees all over. Feeding to Daridranarayana (Poor and Needy) on 3rd of each month is being done by devotees of ashram for last one year. Weekly chanting of Mrutyunjaya Mantra is part of the regular activities at the ashram. Reluctant at first about the Diamond Jubilee Celebration, respecting the overwhelming feeling of devotees, Pujya Swamiji has agreed later on. During the Diamond Jubilee year many activities such as Srimad Bhagawat Katha, Yoga Camps, Spiritual Retreats, Tree plantation, Likhit Japa Yajana, Philanthropic activities, Spiritual Tours, Publication of Spiritual books and many more have been planned during the year 2004- 2005. 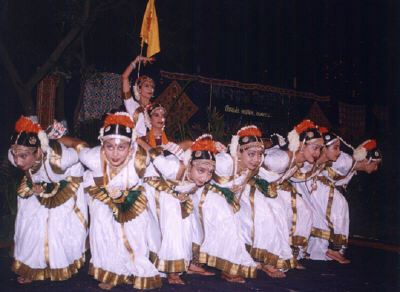 Evening of May 22, 2004 was a continuation of Diamond Jubilee celebration at the Ashram Lawn. H.E Governor of Gujarat Sri Kailaspati Mishraji and Acharya Mahamandleshwar of Sannyas Ashram graced the occasion. Mr. Mukesh Patel, a leading income tax practitioner and past president of AMA, conducted the function. Followings are the highlights of the evening. 1. Two books were released on this occasion. - Gujarati translation of Granth (Book) “Sadhana” by Gurudev Sri Swami Sivanandaji Maharaj (pages 28 + 580) was released by Governor Sri Mishraji. Eventhough the printing cost of the book is Rs. 250 per copy, it will be available for Rs. 60 per copy during Diamond Jubilee year of Rev. Swamiji. 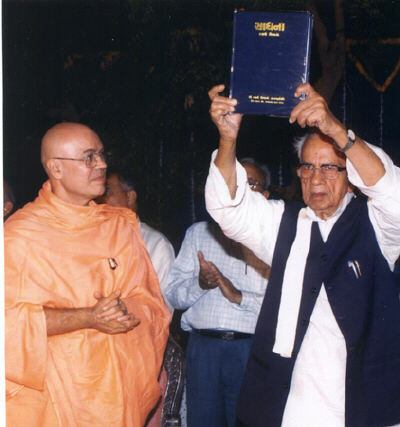 -“Yoga and Swasthya” (Gujarati) by Swami Adhyatmanandaji printed by Gurjar Granth Ratna Karyalaya was also released by Mahamandleshwar Sri Swami Vishwadevanandaji Maharaj. 2. H. E. Governor Mishraji, being a president of All Gujarat Red Cross Society, presented a special honor to Rev. Sri Swami Adhyatmanandaji Maharaj for his generous services to the mankind by donating blood more than 100 times. He is being declared Centurion. 3. Divya Jivan Sanskrutik Sangh and Sivananda Ashram awarded well known Indian classical music expert Sri Krishanakantbhai Parikh for his outstanding services to the mankind in the field of music (teaching) for the past forty years. Governor Sri. 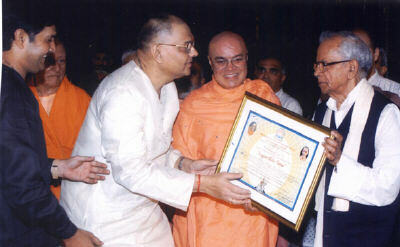 Mishraji awarded him with “Sangeet Kala Ratna”. 4. In the same manner, well known choreographer Prof. Chandan Thakore, Director Nrutya Bharati also were awarded “Nrutya Kala Prachar Ratna” by Governor Mishraji on behest of Sivananda Ashram, A’bad. He is serving his mission of spreading Indian classical dance for the past twenty years with zeal and keenness. The evening was concluded by excellent Bharat Natyam dance performance by artists of Sargam Group and Dandia Ras by devotees from Surendranagar. Sumptuous Dinner was served to all the devotees. 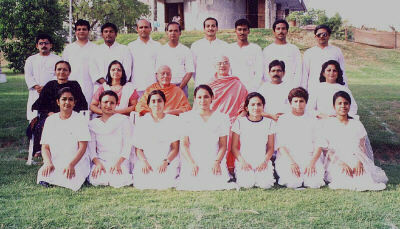 Fourth yoga teacher training camp commenced on May 1, 2004 with Rev Sri Adhyatmanandaji’s inaugural discourse. Eighteen yoga students, including one from USA & one from Muscat participated in the course. Yogasan, Pranayam, Meditation techniques, Kriyas, Mudras, Bandhas, were the part of curriculum. Also related anatomy, physiology, common health problems like diabetes, hypertension, musculoskeletal pains and benefits through yoga exercise were discussed. Other than Rev Shri Swami Adhyatmanandaji, Dr. Ina Patel (M.D), Dr. Kinnari Mehta (M.D), Dr. Snehal Amin (M.B.B.S), Dr. C. C. Rawal (M.B.B.S), Dr. Sejal Modi (B.A.M.S), Smt Rupa Majmudar (Reiki Master), and Mr. Suresh Patel (management expert) shared their knowledge in their own fields with the students of YTTC. Valedictory function was organized in the forenoon of May 20, 2004. President of All India Sadhu Samaj Mahamandaleshwar Sri Swami Mangalanandaji Maharaj graced and blessed the Yoga Students. Certificates were awarded and function concluded with prayers for the peace of the world. Opening of ICCU ward at Sivananda Hospital , Adipur. With the kind and generous help of Kandala Port Trust, an Intensive Cardiac Care Unit (ICCU) was opened at Sivananda Hospital, Adipur. Executive president of Kandala Port Trust, Mr. Jyoti, other dignitaries of the trust, Mr. Yogesh Mehta and local politician Dr. Nirmaben Acharya also graced the occasion. Rs. 75 lacks donated by Mehta family. Dr. Nirmala Gajwani, Dr. Vinod Ruchani and Smt. Mohini Poptani organized the entire function and worked very hard towards this cause and made it possible to have ICCU at Adipur. It will be a boon to so many patients in need of care. On the occasion of 9th anniversary of Bhagavan Sri. Vishvanath Temple, Laghu Rudra Yajna was performed. The shrine was elaborately decorated with fresh flowers. About twelve hundred devotees participated in concluding ceremony and took the Prasad. 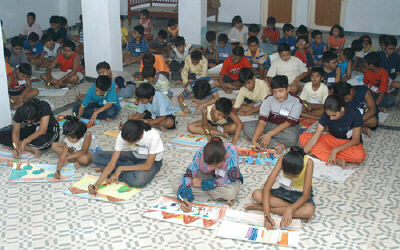 Hundred and twenty children age seven to fifteen attended a week- long residential camp. At the Ashram They were given the training of early waking up, Prayers, Meditation, Yogasana, Pranayama and helping themselves. There was forenoon session of Judo, Karate, painting, sports and music, which used to conclude with half an hour Mrityunjaya Mantra chanting and mid-day meditation. After lunch, afternoon session of teaching them value based living through discussion & exchanging thoughts with learned and scholarly personalities. Evening activities included outdoor games and fun. After evening meditation and supper kids were amused by cultural programs. At conclusion ceremony on May 30, 2004 children put up a great Talent-Show, which was prepared during these eight days. International Labor Day was celebrated at Mahatma Gandhi Labour Law Institute of Government of Gujarat at Ahmedabad. Sri Swami Adhyatmanandaji presided the function and addressed the gathering of Indian civil service officers. Gujarat Divya Jivan Sangh organized a grand event at “Medical Association Hall”, Surendranagar. Rev. 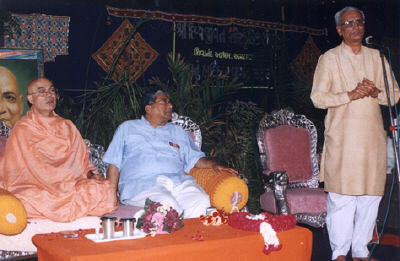 Swamiji presided over this function. Discourse on the subject of “Stress Management “ by Swamiji was received very well. Metro Rotary, Ahmedabad organized personality development program for youth at Nirma Institute of Technology. 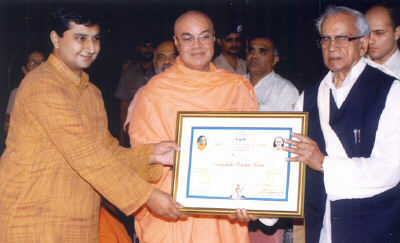 Swamiji gave very inspiring message at their valedictory function on May 8, 2004 . 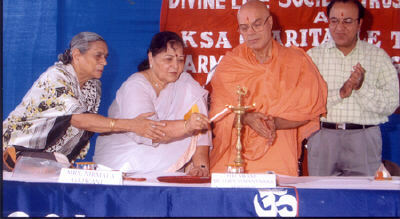 On May 20, 2004 evening Women’s organization of “Rastra Sevika Samiti” (Gujarat Chapter) had celebrated valedictory function in presence of Pujya Swamiji. On May 28, 2004 Rev. Sri Swamiji was invited to address the Officers Union of National Agriculture and Rural Development Bank. The function was organized by Dr. Jivraj Mehta Smarak Health Foundation. Swamiji addressed to first Sikh Aliesh, Army Cadets, Gandhinagar on "Yoga and Stress"